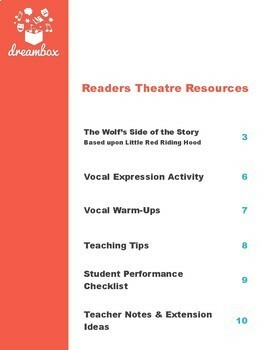 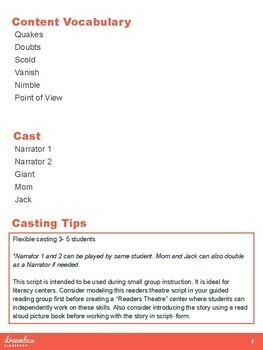 Also included in this download are: 1) Readers Theatre Teaching Tips 2) Student Performance Checklist/ Rubric 3) Teacher Notes & Extension Ideas to incorporate grade level writing skills and visual arts into the learning. 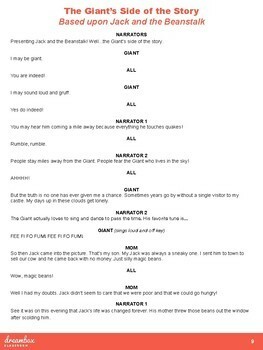 The Giant's Side of the Story- This script focuses in on the Giant's point of view during the major events of the classic Jack and the Beanstalk story. 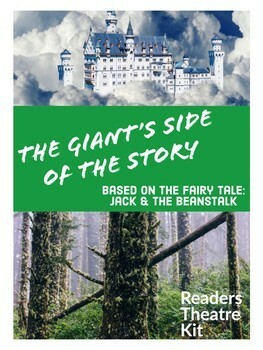 Students will love recounting the story from the lens of the Giant and discovering how he might have felt towards Jack as he continually showed up to his castle and each time single-handedly stole the Giant's precious riches.